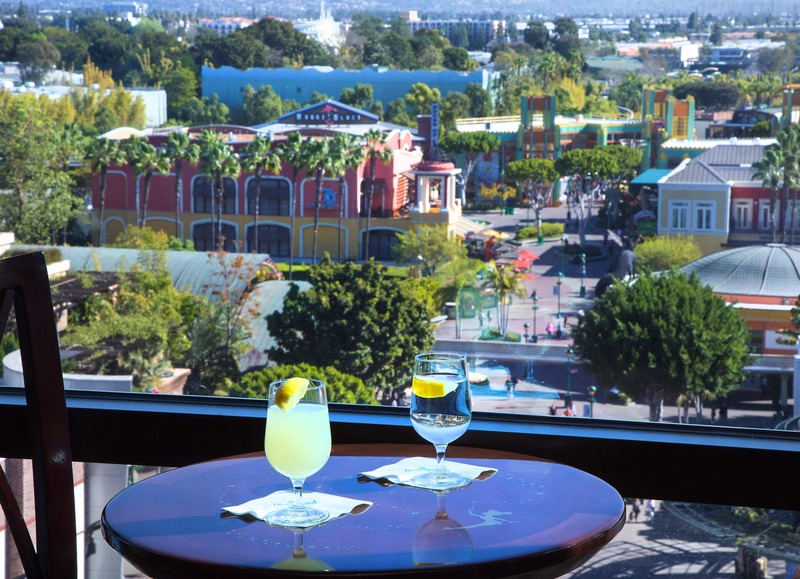 For guests staying at one of our three on-property hotels at the Disneyland Resort, I’d recommend upgrading their reservation to Club Level. 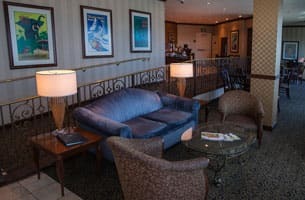 As shared previously in related posts about Beach Comber Club at Disney’s Paradise Pier Hotel and Craftsman Club at Disney’s Grand Californian Hotel & Spa, the Disneyland Hotel has its own special concierge lounge: the E-Ticket Club. With sweeping, East-facing views of the whole resort, the E-Ticket Club is located on the eleventh floor of the Adventure Tower. The elegant setting is great for those looking to indulge in light snacks and relax during the day. In the evening, the club is perfect for viewing the “Disneyland Forever” fireworks spectacular with music piped in throughout! 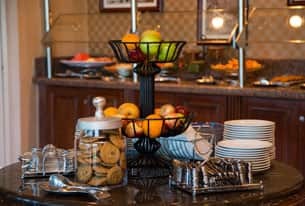 Magical Beginnings (6:30-10 a.m.) – Continental breakfast bar with an assortment of fresh pastries, fruit, cereal and morning beverages. Intermission (11 a.m. – 4 p.m.) – Light refreshments, snacks and beverages. Magic Hours (5-7 p.m.) – Hot and cold hors d’oeuvres, as well as wine and beer. Sweet Dreams (8-10 p.m.) – Delicious desserts and after-dinner beverages. 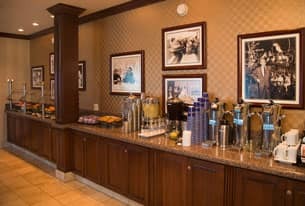 Visit Disneyland.com, call (866) 43-DISNEY or contact your local travel agent if you’re interested in booking a club-level room at the Hotels of the Disneyland Resort. We were blessed to stay at the Disneyland Hotel with Club Level in November 2012. It was a magical experience, and one I hope to repeat “real soon”. The staff in the club are incredible and the view from the lounge is great. I am hoping and praying to return this year! 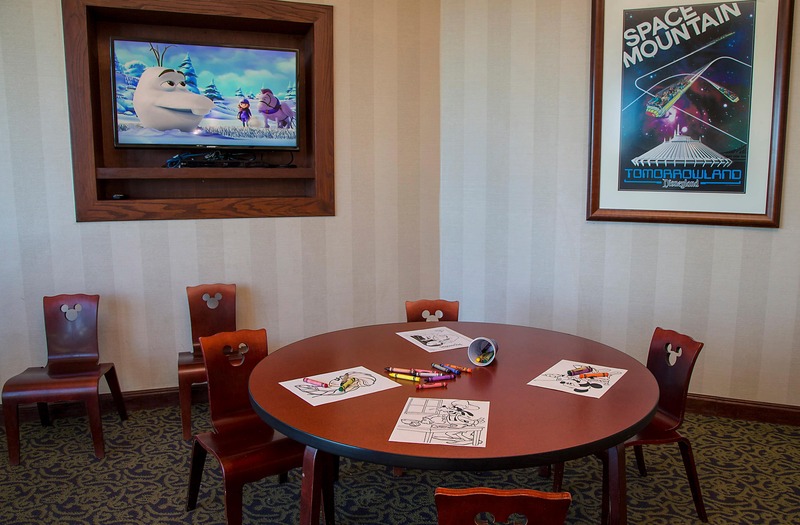 @Gina, children are welcome up there… there’s even a nook for them to watch cartoons and sit at a shorter table. My wife and I enjoyed a weekend up on that level back in September and had a blast. And no fee on the wine & beer. 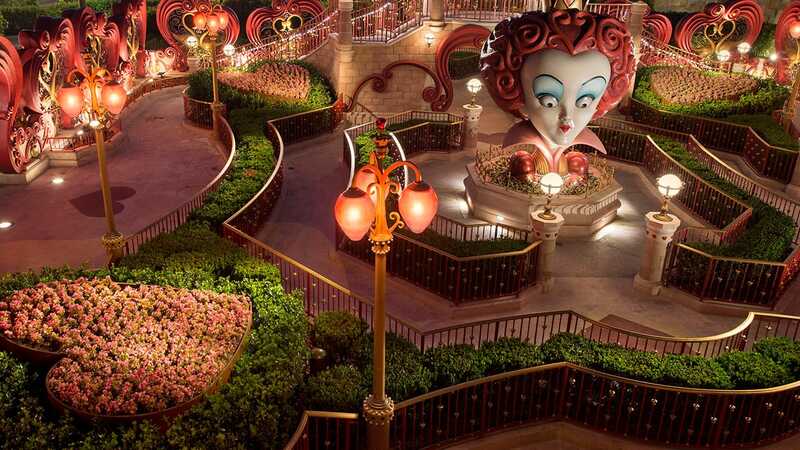 One tip, if you are there for the viewing of the nighttime fireworks, be sure to get there somewhat early. Seating goes quickly and they dim the lights during the fireworks. This sounds wonderful. I am planning a stay at the Disneyland Hotel in May. Two questions: Are children allowed? Is there a nominal fee for the wine and beer?